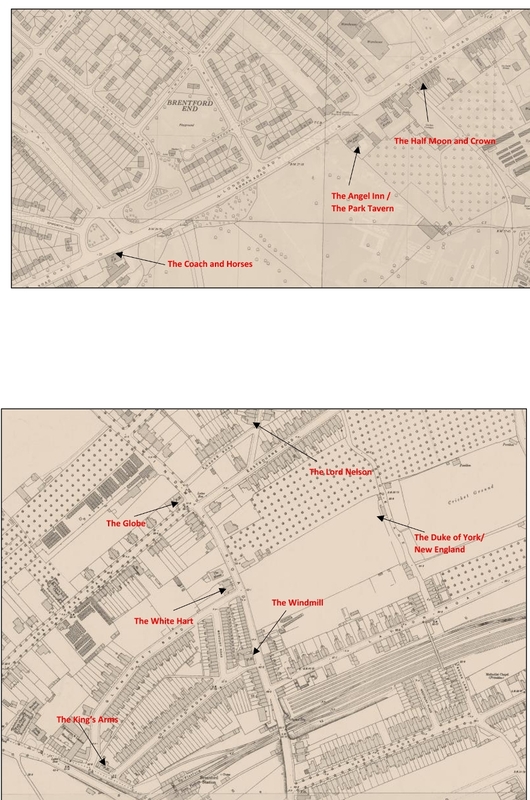 Jim Storrar has prepared maps showing the public houses in Brentford as part of his 83-page document The Pubs, Inns and Beer Houses of Brentford: download - around 8MB. The document covers 112 houses, past and present, and includes many images. This page features nine pubs: the first map, based on the Ordnance Survey map revised in 1959, covers three pubs in London Road, Brentford End, Isleworth parish; the second, based on the 1893 OS map, shows a cluster of six pubs to the north of the railway line, including three on Windmill Road.